...close more sales now with the ultimate program used by internationally renowned technology companies. You too can be selling more technology products and services and be making more money with less effort!" Learn a fresh new approach to sell technology based solutions using a proven powerful step-by-step selling system and increase your sales immediately. My Total Technology Selling System� approach is the definitive guide and will make you more money is less time using established sales methods and techniques specifically designed for the technology industry. Sales processes you can duplicate over and over again to help you close more deals in less time! Unfortunately, too many technology based businesses and professionals have strong technical skills, but don't know how to attract new clients. This is a common problem that I hear over and over again. ...then I think you would benefit from what I have to say. "There is a Terrible Myth that May Very Well Be Killing Your Technology Based Business, Even as You Read this Page. You'll See..."
...many technology based businesses believe that if they have a great technology product or service that business will come to them. Well, you probably do offer the best technology product and you probably do offer great service. You have the best trained employees, the longest warranties, and the most awards. But that alone doesn't bring you all the prospects you can handle... does it? No! If you don't promote your business, it will eventually dry up and blow away - no matter how good your technology product or service is. That's why I've created the SELL More Technology NOW! 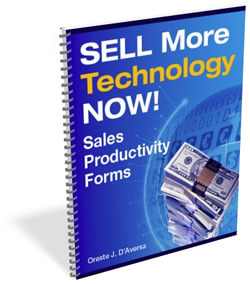 Total Technology Selling System� and Sales manual. 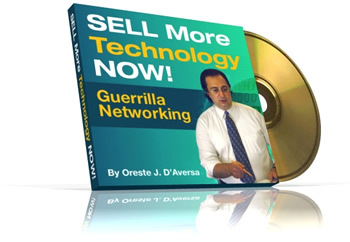 "Now You Can Give Your Business The Unfair Advantage, Using Innovative Marketing and Selling Tactics That Get Results Fast"
Each SELL More Technology NOW! manual contains well over 200 pages, packed full of proven technology marketing and sales practices, that will improve the sales of any technology based product or service. It doesn't matter if you are a technology provider in the areas of hardware, software or professional services. What you'll learn in these manuals will allow you to dominate any market of your choosing... guaranteed. "Who Am I and Why Should You Believe Me?" My name is Oreste J. D'Aversa and I have been in the technology industry for over 20 years and have worked sales and consulting positions my entire professional life. I have worked for some of the world's largest technology companies, such as Computer Associates, PeopleSoft, and Cyborg Systems, closing software and professional services deals ranging from the low five figure to multi-million dollars. I've also been a Director of Sales for a start up "dot com" and understand the challenges of selling technology based products and services when you are not a well known name like Microsoft. I personally continue to use these technology based marketing and sales strategies in these manuals. This is not just theory. I know it works because I use it myself in my own technology based sales consulting business. "But You Don't Have to Believe Me. Here's What Other People Are Saying About Me and My Methods..."
"Your book is exceptional, I�ve personally read the copy you gave me and it held my interest from beginning to end as it covered not just a few but all of the formulas needed to successful prospecting and selling. I would say �Thumbs Up�, we certainly recommend you as a fantastic speaker. " "I was wasting a lot of time..."
"As a physicist and engineer, I was wasting a lot of time over-cerebralizing the entire sales process; this was costing my business time, effort and money. Rusty's straight-shooting and to-the-point teachings shed a lot of light on the art and science of selling. Rusty has systemized and packetized selling to the point where anyone who studies the course materials diligently should see an improvement in their business." "VARs are skilled at technology but often have a difficult time SELLING and packaging their SOLUTIONS to the needs of their customers. I was very glad to have you not only as a sponsor at our 7 June 2005, "Marketing to Small Business for VARs and Technology Consultants" seminar but also to have you contribute your expertise to the VARs and consultants in attendance. If more VARs invested in sales training their businesses would GROW." "I would recommend you to anyone who is interested in the potential of significant sales increases that come from an improved sales process and monitoring system". "The services you provided in the areas of sales, marketing, technology, training and professional coaching have been instrumental in our growth, revenue generation and increased productivity of our sales and marketing organizations"
what we were looking to accomplish at this program; wonderful job!" Whether your selling computer software, hardware or other technology based products and services, selling in this environment requires you have special methods and tactics! You are not selling refrigerators in the retail market. You are selling a technology based solutions to the business marketplace. The business users issues, business and technical, are very different than that of the business-to-consumer marketplace. You need special sales methods, techniques and tactics that only some one from the industry can teach you. These proven secrets are now revealed to you in easy to understand sales processes that you can duplicate over and over again. Whether you have no sales background or are a industry professional you will be learning sales methods and techniques you can use immediately to increase your sales, close more deals and be more productive! These techniques are not just sales theory but currently applied sales methods and practices being used in the field to consistently close more deals. Theses sales processes have closed millions of dollars of sales revenues. Now you too can learn them in the comfort of your office, home or car. You will be applying what you learn immediately! These sales methods and practices will give you the edge over your competition to close more business. Giving you proven sales methods and tactics in your selling toolbox! 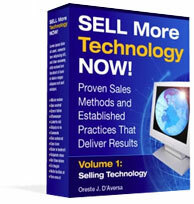 In Volume One: Selling Technology - You'll Learn $tep-By-$tep Processes to Make More Money! In Volume Two: Strategic Sales Planning - You'll Learn How to Plan Your Way to Sales $uccess! In Volume Three: Technology Marketing - You'll Learn How to Get New Customers to Come to You! Easy clear plan teaching you a proven step-by-step systematic approach to implementing marketing and sales techniques to increase business. Practical sales processes designed for marketing and selling technology based solutions that can be used immediately. Learn proven marketing and sales practices to increase your sales productivity and sales revenues. Exercises strengthening your knowledge about a particular subject area. Desk reference tool that will always be available to you. 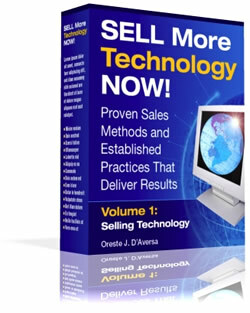 In Volume 1: Selling Technology of this 347 page manual you will learn actual sales techniques and practices used by some of the largest technology based companies in the world. These step-by-step processes show you exactly how to close technology based sales with methods you can duplicate time and time again. Chapters contain technology selling practices, exercises and worksheets you can master with little effort and start using them immediately to close more deals, generate more sales revenues and increase your profits! Plan your work and work your plan. Studies have shown that those technology based businesses and sales people that develop and use a sales plan out-perform those that don�t have a plan by 30%. You can create a successful plan for your technology based business in less than a day following this simple six-step plan. The six basic components to creating a successful Sales Plan. The importance of clearly defining your Objective. How Targeting your Market will get you more clients. Sales Strategies you must know to be successful selling technology based solutions. How Marketing Activities keep the clients coming. How to define and attack Territory to be more productive. The importance of using contact management software to dramatically to increase sales performance. A actual Sample Sales Plan used to generate millions of dollars of technology based sales revenues for a major technology company. Sales Plan Worksheets to help you map out your master sales strategy. Time and territory management is critical to your success. Whether your a large technology based company, a technology based sales person or consultant, if you "work smart" on a daily basis your sales will explode and you will far exceed your sales goals! How to master your time and effectively increase your sales productivity. Understand the Value of Your Time and identifying money making activities. Time Management Basics that will save you over 10 hours a week. Daily Schedule Worksheet to plan your sales activities and maximize your effectiveness. The three critical keys to Territory Management. My Territory Monthly Prospect List will help you build more sales with key accounts. Six tips to generate more revenue and manage your Territory more effectively. What Your Customer Really Needs, Wants and Desire? By understanding what customer wants you will find yourself selling more technology based solutions. Many customers give you a "symptom" of their problem, you want to get to the "cause". By doing so you will find yourself generating even more profits. Always be "customer-focused" in your sales approach and watch your sales skyrocket! Three things that you need to know about how your customer thinks. The "must have" Marketing Tool that will give you the edge over your competition. How learning about your Customers Background and Business Practices will help you generate more technology based sales. Knowing how to analyze your customers problems the critical step to helping your customers and closing larger deals. How to Qualify the Prospect quickly turning a prospect into a customer effortlessly and without "high pressure" sales tactics. Sample Customer Assessment Tool that will help you immediately identify the prospects needs. Be viewed as the expert in your field and close more deals faster! Chapter 4: How to Tell People Exactly What You Do in 90 Seconds! The business world travels at a much faster pace than ever before. Business people don't have time to understand your technology based solution. You must tell them in a clear, concise manner exactly how your offering will be of superior value to their business. How to starting Closing the Deal as soon as you meet a prospect. Learn the "must have" business introduction that guarantees you Network like a professional without stress. How to create your own Technology Based Business Value Proposition that will have prospects asking you for more. Sample a Technology Based Business Value Proposition you can use immediately. Worksheets to create your own compelling Technology Based Business Value Proposition that will guarantee your success. Chapter 5: How to Fill The Sales Pipeline with Hot Leads! The Sales Pipeline is the life's blood of your business. Slow down the flow of prospects in your sales pipeline and watch your business slowly grind to a halt! The techniques in this chapter will keep your pipeline filled with hot prospects! How the low cost method of "Drip Marketing" can have your phone ringing off the hook. "Insider" tips and techniques about effective Direct Mailing. How to write effective Sales Letters so prospects contact you. Actual sample of a Technology Based Sales Letter. How to use Email as part of your low cost marketing strategy to get new customers. How to use the Internet as your virtual business storefront to make money while you sleep. How to find more qualified prospects when selling Person-to-Person. How to use Seminars as a low cost sales tool to drive new customers to your technology based business. How to turn your telephone into a secret weapon that will generate new clients at a very low cost. Using cold calling with a contact management system will explode your sales productivity! The three main benefits of Cold Calling to help you get more customers. Six proven calling strategies use by internationally renowned technology companies. Four Calling tactics to get you more appointments. How using Telephone Scripts will make more natural and relaxed. A Sample script that you can duplicate for continued success. Create you own powerful script with the Telemarketing Script Worksheet. Telephone worksheets to help you monitor your progress and improve your appointment percentage. Chapter 7: How and Where to Find Good Clients! Finding clients is critical to the growth of your business. There are many hidden "goldmines" where you can prospect for new clients at little or no cost. You no longer have to spend a fortune to get a steady flow of well paying customers. "Insider" Advertising techniques to improve your response rates by 20% or more. How to use Charitable Organizations as a low cost lead generation tool. Introduce your technology based products and services to Chamber of Commerce members to get more clients. How to generate more leads at a Business Networking function. How to build strategic alliances and find new clients at Business Associations. The "hidden" gem to find clients in your Local Business Publications. How to get more Referrals and help your business grow much faster with little effort. Strategic Business Alliances will create a no cost lead source. Unlock the power of Target Mailing Lists to get more clients. How to generate leads at Trade Shows when you do not you have a booth. How to maximize leads at your Trade Show booth with my proven success system. Whether your the business owner, sales person or a consultant of a technology based company, when it comes to getting and managing deals you are in charge. You have to run that deal as though you are the quarterback of a football team. Strategy, tactics and "getting it done" is your responsibility. This is the bottom line when selling technology! These methods are currently being used by some of the largest technology companies in the world and you need to be using them as well to close more deals faster! This is the "inside track" on selling technology based products and services. You'll be selling more than your competitors in no time! How to understand and use to your advantage the critical "Complex Sale" when selling technology based solutions. Understanding the "Buying Influences" and how that information will help you move your technology based deal faster. Increase your sales effectiveness and productivity with the Account Management Form. How to use the power of your Headquarters to close more deals in less time. The power of "Executive Bridging" can bring in deals you thought were unattainable. A blue print shows you what needs to be accomplished for a particular project. You build a house with a blue print, now you can use a blue print to make your technology sale. Unleash the power of the Sales Deal Blue Print and close more deals faster. Clearly Identify what technology based product and services you are selling. Have all the answers to the "tough" Sales Questions to close your deal faster. Know who your "Buying Influences" are and their respective roles. Identify the prospects Reporting Structure so you know how to deploy your resources efficiently. How to a more effective Sales Strategy to close your deal. Clearly define your prospect's Decision Making Process to avoid missing critical information necessary to close your deal. You will have a step-by-step system to perform the necessary tasks in your sales process - Needs Analysis, Presentation, Signed Contract, etc. Identify "Red Flag" issues so they can be resolved immediately. Know your Competition's strengths and weakness so you can plan your winning strategy. All successful businesses have a sales process to close deals consistently. Having a sales process for your technology based business will help you close more deals in much less time. Understanding the Advantages of Standardizing your Sales Processes and use them to increase your sales revenues. How using a Sales Process can help close deals faster. How to use the power of sales reporting as part of your Standardized Sales Process. Increase your closing percentage using Sales Process Guidelines. How the Sales Pipeline Report can give critical business sales intelligence for your business. Create your own step-by-step Sales Process with The Sales Process Work Sheet. Your Secret Weapon to Help You Maximize Every Opportunity! Be viewed as a true technology based sales professional by conducting a proper needs analysis. The Sales Processes Questionnaire is an easy to use tool that will get your "prospect" to become a new "client" in no time at all! Tools are only good when you know how to use them. Unlock the power of The Sales Deal Blueprint with The Sales Process Questionnaire. Have a systematic approach and process to close more deals with The Sales Process Questionnaire. How to qualify your prospects quickly with the Meaningful Conversation section. Determine what technology based solution your prospect needs, wants and desires in the Needs Analysis section. Be prepared like a true technology based sales professional using the Presentation section. Show your technology based product or service like a "pro" with the Demonstration section. The Post Demonstration Follow-Up section is critical to move your deal faster. In the Proposal Submission section you will understand your prospect's buying process. How to move your prospect to a signed deal using The Contract Phase section. An Example of a Sales Process Questionnaire you can use immediately. Preparation is critical when meeting with prospective customers. Being prepared before you go on a sales call will separate you from your competition and will ultimately get you the deal. It is easy to do and takes very little time so blow away other vendors by being prepared for your sales calls. Sales Call preparation is the key to closing more deals in less time. Use the Sales Call Plan Form to guarantee a professional sales call every time. How having a Sales Call Purpose will give you a laser beam focus everytime. Having specific Sales Objectives will give you detailed tasks to accomplish when meeting with your prospect. By understanding your Prospect's Objectives you will be able to move the deal faster for a "Win-Win" situation. You will have a Sales Call Strategy to know what you are going to do once you get in front of your prospect. Perform the proper Research for Your Sales Call and your deal will be half way closed before you even get there. How to prepare a Sales Agenda that will make your meetings more productive and efficient. How leaving the right information will move your deal faster. How to get the right information to keep your deal moving forward. A sample of a Sales Plan Form to be productive immediately. Knowing how to present your technology based solution is a very important step to closing the deal. You must present value in a clear concise manner and move your prospect closer to the deal. The importance of Presentation Skills to your sales process. How to communicate more effectively with the use of "Presentation Speak". Seven basic questions you need to answer in your Presentations. How to construct a dynamic PowerPoint presentation. Tips for delivering effective technology based presentations. An sample of a Presentation Preparation Form. Your prospect is going to want to see your technology based solution in action before they decide to buy it. If you sell software a demonstration will be required. For services, your prospect will require references and a site visit. Either way you must be prepared so you can win the deal. Techniques you must know to deliver a dynamic and effective demonstration. The thirteen principles you must know to deliver effective demonstrations. A sample of a Demonstration Preparation Form. The five reference steps you must use to close to the deal if you are selling technology based services. A sample of the References Form. Chapter 15: Proposals That Get Attention and Don't Bore People to Death! You will need a proposal of your technology based solution. You must spend more time selling and less time writing proposals. Learn how to prepare easy to understand and concise proposals that get noticed. How you can get proposals out faster with the Technology Solutions Proposal Template. The nine keys your technology based proposal must have to be successful. A sample of a Technology Based Solutions Proposal. 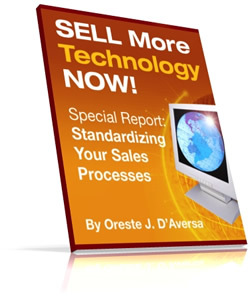 Most if not all of your technology based sales deals are going to have objections. Objections are a good thing because if your prospect did not have any objections or questions they would not be interested in your technology based solutions. How Objections are a good thing to move your deal forward. Learn why prospects have Objections and how you can over come them. The seven categories of Objections you must know. Tips for easily handling objections. How to have a Strategic Plan for Handling Objections. You will have the answer for every question and be prepared for every objection before your meeting. A Sample of Handling Objections Worksheet. Chapter 17: The Contract Phase - Negotiate To Win! Contracts and negotiations are a necessary part of closing technology based sales deals. You want to be prepared to a achieve a "Win/Win" closing with your client so the business relationship starts off on a positive note. How to prepare yourself Before the Negotiation. Dealing with Pricing Issues During the Negotiation. Protect yourself with Service Level Agreements (SLAs). Seven tips you must know to conduct "Win/Win" Contract Negotiations. A Sample of a Negotiation Worksheet. Competition is present in most technology based deals you will be working. Know how to beat your competition by understanding how they operate. Some basic research will produce knowledge that will help you outsell other vendors and make you shine in front of your prospect. The eight important questions you need to know about your competition. How using a Competitive Analysis effectively can help you out maneuver other vendors. An Sample of Competitive Analysis Worksheet. A Sample Competitive Analysis Worksheet completed used a technology based product. It's all about closing the deal and delivering what you promise to your new client. Closing your prospects for their business is a natural part of the sales process. Once you close your deal deliver what you promise and turn your client into a great reference. How to spot the Prospect's Buying Signals. Sample Buying Signals with Closing Statements. Delivering what you promise the key to your success. Become the "Trusted Advisor" and become the "go to" person for your client. Evaluating every deal whether successful or not will be critical to your long- term success. Learn how to duplicate success and make adjustments when necessary. This will dramatically improve your ability to close more deals in less time. How to evaluate and improve your sales deals. The "Win/Loss Report" - your sales tool for improvement. A Sample of a Win/Loss Report. "Proven to be a Critical Asset"
"Your extensive sales knowledge has proven to be a critical asset as you work with our clients to define their sales processes. Your consultative and analytic approach allows you to take complex work flows and break them down into simple procedures that can be easily taught and implemented. Your combined knowledge of the training process and technology make our training sessions very productive and engaging." A Three ring binder with 347 pages of proven methods and practices to increase your marketing and sales productivity with compartments to safely store and carry your CD-ROM library. 10 CD-ROMS with over 8 hours of solid content to re-enforce the knowledge you have accumulated also useful to prepare for sales calls in your car ("portable classroom"). Don't have time to read, learn and absorb the material in the comfort of your home, car or office. Bonuses (valued over $400) (see below) with your purchase giving you immediate value with your purchase. This entire program is valued at over $680 for a limited time only is being sold at $299. (a $299 value) Get a 45 minute sales telephone consultation that will have an immediate impact on your bottom line! Work with me one-on-one to increase your sales revenues, productivity and effectiveness! Use these sales productivity forms to better manage your time and increase your sales profitability by not leaving anything in your technology based sales process to chance! "How Standardizing Your Sales Processes Using CRM Solutions Can Increase Your Sales Revenues by 50% or More in Less than One Year!" "10 Low Cost/No Cost Techniques You Can Use Immediately to Close More Business in 30 Days!" 10 Proven Techniques You Need to Know to Networking Successfully and Get More Leads Immediately!" "Oreste "Rusty" D'Aversa spoke to our group on September 21st. Our members were very pleased with his presentation on Networking. We found his talk to be quite professional and he seemed to have much experience on the topic. We would not hesitate to recommend him to any other group"
I am so sure that you will find my books and CD-ROMS to be the best investment you can make towards closing more technology based sales that I offer a 90-day money-back guarantee. If you are not satisfied, for any reason, simply return the merchandise to me post-paid within 90 days and I will promptly refund your purchase price. SELL More Technology NOW! Manuals at an Affordable $199 each"
FIRST REASON: I wanted to make sure that you have an IMMEDIATE PAYBACK from my SELL More Technology NOW! manuals. I guarantee that after you implement just one of my marketing and sales strategies that you'll get enough business to pay back your investment in this program three-fold. Think about it, if you get one deal as a result of these manuals, you will have made your money back many times over. At this price point, it's a "no brainer." SECOND REASON: I want you to be absolutely overwhelmed by the amount of information and tools included in the SELL More Technology NOW! manuals, compared to the investment I'm asking you to make. I want you to be so impressed with this program that you'll go out and tell all the technology based businesses and sales professionals you know to invest in it as well. You see, the contents for each SELL More Technology NOW! manual took me well over 200 hours to develop That equates to over $26,000 of my personal consulting time. (Not to mention all the years I have been selling technology based products and professional services.) You can't buy all the knowledge, exercises, diagrams, special reports, and bonuses included in this package anywhere! THIRD REASON: I didn't want to price it so high that the small technology based companies and sales people couldn't afford it. Okay, now I'm going to be brutally honest. I priced the SELL More Technology NOW! manuals at $249 so that I could sell a lot of them. Why? Because I have a lot of other great products that I'd like to offer you after you purchase the manual. "...Order the SELL More Technology NOW! manuals Now and You'll Receive All Five Bonuses at the Current Price"
Remember, the Five Bonuses are only being offered for a limited time at the current price. In the near future they will be offered as an upgrade at a much higher price! P.S.S. Visit my other site Skyrocket Selling (www.skyrocketselling.com) for FREE information on selling and other products and services available. P.S.S.S. I have just announced an affiliate program for organizations and website masters. If you are interested send me an email at Affiliates@SELLMoreTechnologyNOW.com to learn more! Contact me today at 201-391-1921 to get your FREE Marketing and Sales Analysis (a $500 Value). Learn your strengths and areas that need improvement so you can start closing more business, generating more revenue and have more job satisfaction immediately! 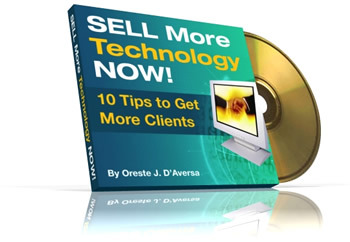 Copyright � 2006, SELL More Technology NOW!. All rights reserved.